The setting was rather rustic chic but the ambience was pleasant, even if a chill breeze did rustle the walls, and my fellow patrons of this fine dining establishment were in good spirits. "Would you like onions with that?" the waiter politely asked. "Yes, please," I replied. Damn right I wanted onions. And whatever else was coming with this dish. I was expecting a lot from this experience, given that it was the most expensive lunch I've had in a while. He placed it expansively before me in two halves on a sheet of gossamer thin paper, playfully printed with blue burgers almost exactly as you might expect to find issued by a common-or-garden chip van. I took it as a chi-chi ironic gesture. Very Heston Blumenthal. Officially it was the Piedmontese burger but, in this setting, might more appropriately be called the Gourmet Cyborger. "You can help yourself to crisps or we have bars and there's a bottle of water there," the waiter generously added, in exchange for my €20 token. With no table service provided at this establishment, I was forced to go native and eat as the 'natives' do - on the hoof. So to speak. I slapped it inelegantly together and took a bite as I walked. The irony faded right there, amid the sweet, rather un-gourmet taste of an ordinary burger bun and chopped onions, so over-fried as to have no taste left. The burger itself was pretty good, with meltingly tender meat. Piedmontese beef is a lean, premium product. The meat also happens to come from the white cows that wear the little bells in the Alps. So no gripe with the burger itself. The accoutrements however, left a lot to be desired. And, it was small - I gobbled it up in six bites. 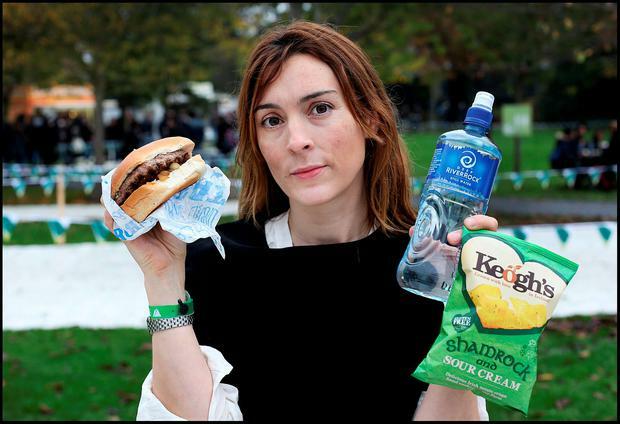 So I had the crisps - and then felt ill.
A Dublin butcher sells a 200g, raw Piedmontese steak burger for €3.49. That's quite the mark up - even in virtual land.